The Hello Girls, with music and lyrics by Peter Mills and a book by Mills and Cara Reichel, is a look at century-ago bilingual Bell Telephone operators who joined the Signal Corps, crossing the ocean and getting messages through to the front lines—essentially America’s first women soldiers. It’s a heady subject. And The Hello Girls contains everything a musical needs: potentially interesting characters, conflict, drama, melody, diversion, and message. It’s impressive. And it’s frustrating. Riser (Arlo Hill) interviews Grace (Ellie Fishman) in The Hello Girls. Top: Fishman fields messages at the front. That’s because Mills and Reichel, and the gifted cast of 10, who do a lot of John Doyle-ish instrument-playing, everything from twin pianos to xylophone to cello to trumpet, keep the audience at a remove. They have an important story to tell, but Mills and Reichel stint on the character points that would make us care sufficiently. Basing these hello girls on real women and composites thereof, they’ve focused on five, each accorded one basic personality trait, two if they’re lucky. Grace (Ellie Fishman), who becomes the unit’s supervisor, is eager to prove herself. Louise (Kathryn Wake) is vivacious and unruly. Helen (Chanel Karimkhani) is the scaredy-cat. Suzanne (Skyler Volpe) is Grace’s best friend. And Bertha (Lili Thomas), well, Bertha hasn’t much to play at all. They’re more conduits for plot progression than people, and that extends to Lt. Riser (Arlo Hill), Grace’s commanding officer, who’s skeptical about the girls and goes by the book, and that’s that, though Hill does get under Riser’s skin and provide some welcome character quirks. Even Gen. “Blackjack” Pershing (Scott Wakefield), when he finally shows up, proves to be rather a nonentity. There are good scenes—a tense encounter between the girls and a German prisoner, who points up the hypocrisies on the Allied side, and a fine song for Grace, “Twenty,” where she’s convincing Riser that her unit is ready to endure the hardships at the front, to name two. Mills’s music has its pleasures, and the title song, with the doughboys welcoming the distaff unit, is a moment of uncomplicated musical-comedy happiness. The dialogue faces the difficult challenge of sounding neither too period, which would register as la-di-da to modern ears, nor too contemporary. Mostly it succeeds, though one doubts “ASAP” was in general usage in 1918, or that one girl would hiss to another, “You’re a sneak.” But there’s a lot of information to be spilled out, and it comes at the expense of the human element. Couldn’t these ladies develop more, end up different from how they started? All these young men and women at the front, and no love story? No, the female-empowerment angle, worthy as it is, crowds out everything else. All that instrumental double duty makes for awkward staging—for instance, one giggle-inducing moment when a soldier pretends his violin and bow is a rifle. Or when a sulky Louise stomps off to her quarters, where she’s been confined for insubordination—oh, but first she has to pick up her clarinet. Private Matterson (Andrew Mayer) doesn’t quite romance Suzanne (Skyler Volpe). Photographs by Richard Termine. Lianne Arnold’s set is essentially pegboard and staircases, but it does provide helpful projections, including some period films and maps that clarify where the action is taking place. 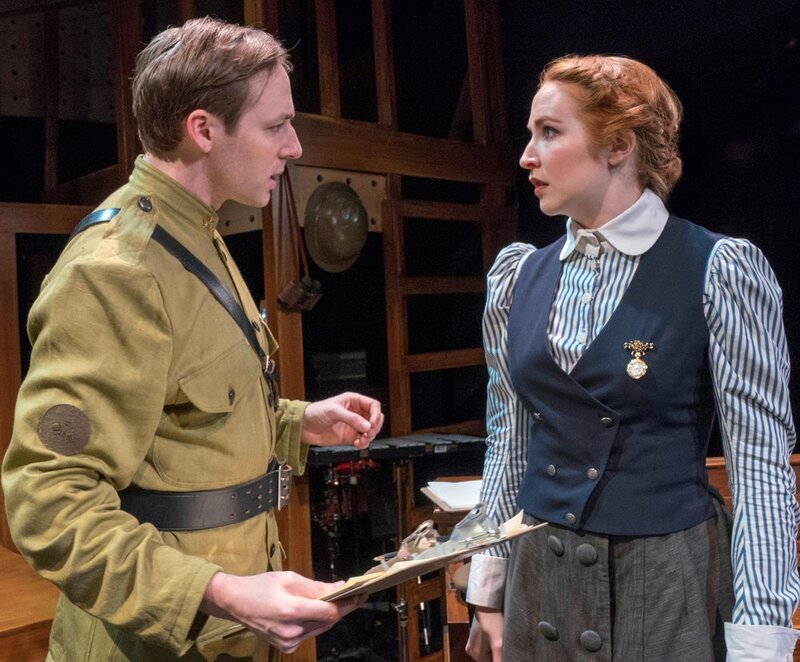 Whitney Locher’s costumes, mostly uniforms, are functional, as is Isabella Byrd’s lighting, but Kevin Heard’s sound design serves up some convincing war noises—and over-mikes the actors, sometimes obscuring the lyrics. Reichel directed, in a face-front-and-declaim way. The girls were dealt a shocking postwar injustice by the Army, which is related near the end, and might be a better curtain point than the “Making History” finale, which prosaically retells us what we’ve learned during the last 2½ hours. Admirable as The Hello Girls’ objectives are, and despite its well-turned score, it struggles to feel like more than a tutorial. War is hell. So is character development. Prospect Theater Company’s production of The Hello Girls runs through Dec. 22 at 59E59 Theaters, Theater A (59 E. 59th St.). Evening performances are at 7 p.m. Tuesday through Saturday. Matinees are at 2 p.m. Thursday, Saturday, and Sunday, except for Sunday, Dec. 2, when it’s at 6 p.m. There is no Thursday matinee on Dec. 6. Tickets are available by calling Ticket Central at (212) 279-4200, by calling the 59E59 Box Office directly at (646) 892-7999 or by visiting www.59e59.org.